This FreeOffice at least looks far better than the M$ monstrosity (I am proud I have never had it on my machines- in fact when it comes pre-installed it is one of my first tasks to remove it). Once I had OpenOffice but I don't really need an office package- without an office the only thing I can't do is view the reports of clipboard managers/text editors/file managers performance tests one user here at the forum creates. I don't like proprietary formats like DOC and DOCX so I avoid them but when it's not possible I use the commercial Atlantis Word Processor to open them. I am curious- have you ever used LyX? smaragdus wrote: I am curious- have you ever used LyX? Been meaning to for ages, but never really got down to it. Sadly, there's very little opportunity for it in my context -- most of the documents I have to deal with are either in MS Office formats or PDF. Thank you for your response. I am curious- does the info in the sidebar (FreeOffice information) disappear in your portable installation too or this occurs on my machine only? This happens with both versions of FreeOffice I have (Rev 698 & Rev 703, the latter seems to be the latest). Should probably report this to Softmaker as a bug. get the most powerful free Office suite for Windows and Linux! FreeOffice has millions of users worldwide. Since its release four years ago, it has been widely praised for its outstanding compatibility with Microsoft Office. Thanks for the update, Ennovy! I just downloaded it, but haven't installed it yet. Filesize for the installer is 73.4 MB. This probably means that the uncompressed filesize for FreeOffice is going to be substantially larger. I remember FreeOffice 2012 being quite small. If what I experienced was a bug it is no longer present in SoftMaker FreeOffice 2016 (Rev 755). SoftMaker FreeOffice Rev 703- installer- about 59 MB, unpacked- about 61 MB. SoftMaker FreeOffice Rev 755- installer- about 75 MB, unpacked- about 78 MB. However TextMaker doesn't seem to be able to save files as DOCX- please correct me if I am wrong. Thank you very much for the notification. 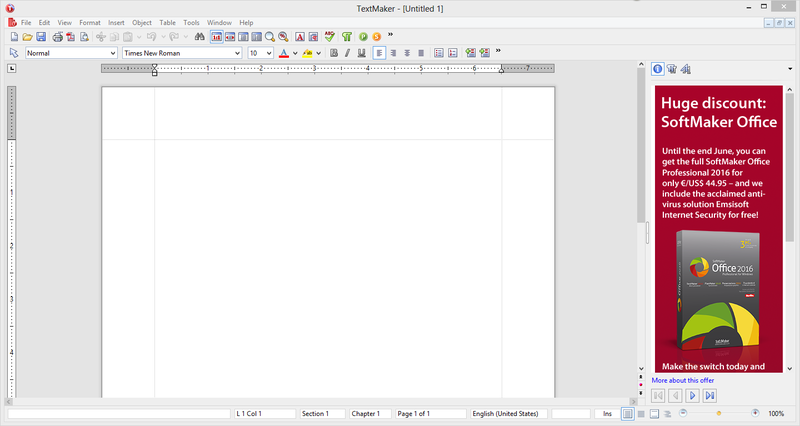 smaragdus wrote: TextMaker doesn't seem to be able to save files as DOCX- please correct me if I am wrong. smaragdus wrote: Thank you very much for the notification. I use this software for many years now (the standard version) and I love it. Thanks for the comparison. I rarely edit office files but Softmaker FreeOffice is definitely a keeper, small package, nice GUI, portable. They might have allowed saving DOCX files in the free version but anyway I can do that via the cheap commercial Atlantis Word Processor. I don't know if this helps but I have an older version of FreeOffice (which is just a rebranding of Softmaker) rev.698. It will open but does not let you save to DOCX. smaragdus wrote: ... does the info in the sidebar (FreeOffice information) disappear in your portable installation too or this occurs on my machine only? I'll try to check this. I'd very much like to switch the old SoftMaker 2006 entry (obviously now 10 years old) to something more current. The program requires registration, which means -- barring policy change -- it's not eligible for entry into the database Edit: It also requires an Internet connection so the code isn't enough, it's got to phone home. As usual, there's that same USBCopy.exe file in the root folder but you have to register the program before you can run it. Related: FreeOffice review: http://www.linuxinsider.com/story/83349.html ... Note that the article claims that the program is open source but I couldn't find any data on that. For me this is distracting and nasty. If someone is aware of a way to permanently hide this abominable sidebar please let me know. Topic update: SoftMaker FreeOffice is currently v2016 rev 758 (no separate changelog found for free version; commercial version changelog is at http://www.softmaker.com/en/servicepacks-office-windows and http://www.softmaker.com/en/servicepack ... -revisions). I'm still on SoftMaker Office 2012 (rev 698, but I see an update servicepack available for rev 702 at http://www.softmaker.com/en/servicepacks-softmaker-old) which never displayed that grantedly annoying banner ad found by smaragdus. BTW, the older discussion of SoftMaker FreeOffice at "Submissions" is at http://www.portablefreeware.com/forums/ ... php?t=3938. The free PDF viewer that lets you create high-quality PDF files from inside any Windows application. Have you ever wanted to turn a document into a PDF file, but the application didn't offer PDF export? FlexiPDF Basic solves this problem. It lets you create PDF files with a single click: just choose an application's "Print" command and select the FlexiPDF printer driver. It's that easy! In addition to that, FlexiPDF Basic includes a great PDF viewer that lets you read, print and annotate PDF files quickly and conveniently. Download FlexiPDF Basic today and use it for as long as you want. It's free for home and business use.